These fun party people glass markers are great for keeping track of glasses at a party. 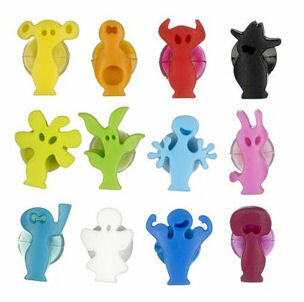 The unique figures attach themselves with a suction cup to any smooth surface. Set contains 12 unique characters. It can be hard at a party to keep track of your drink, and this pack of 12 colourful characters will help you and your guests keep track of their favourite tipple/s. Each character has a small suction cup that sticks to any smooth surface. Each unique character has its own personality; the markers are a fun talking point, which character will you be?